I tried wonton wraps for the first time last night and it was a hit! And overall the cost of dinner was really cheap for 2 adults. First I sauteed 1/2 a green pepper, 1/2 an onion, 2 cloves of garlic chopped and 1/2 a package of firm tofu cubed. Cook until the peppers are tender and the onion is translucent. Near the end of the cooking time I added 2 Tablespoons of taco seasoning. Using only 1/2 a package of wonton wraps I added 1 1/2 teaspoons of tofu mixture into the center of the wrap. Using water to wet my fingers to press the wrap closed. 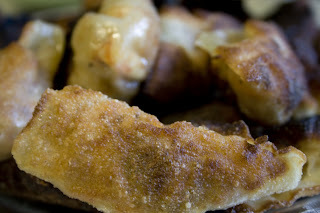 I then fried the wontons in oil until brown and crispy. Make sure to make all the wontons before frying. This is the part of the meal where I'll have to practice because I burned a few, but I was also trying to fill and fry as I went along and it's clearly not the way to go. Try this easy dinner on your family tonight.